What’s next for Najib Razak, Malaysia’s disgraced former prime minister? Former Malaysian prime minister Najib Razak is greeted by his supporters as he leaves the Kuala Lumpur High Court. The arrest of Najib Razak, the former prime minister of Malaysia, on Tuesday was widely expected. In fact, many Malaysians were hoping he would be arrested immediately after the ruling party, the United Malays National Organisation (UMNO), was defeated in the May 9 election. Najib was the main reason why UMNO lost – he was widely seen as corrupt and the main person behind the scandal at 1Malaysia Development Berhad (1MDB), a state investment fund. US prosecutors have accused Najib of diverting US$731 million from 1MDB into his personal bank account. Many people assume Najib’s arrest is connected to this fund, but legally speaking, he faces charges relating to a company called SRC international, a one-time subsidiary of 1MDB. SRC took a loan of about US$1 billion from a state-run retirement fund and Najib is alleged to have siphoned off about US$10.5 million from the top. The money allegedly ended up in his bank account, the same account that was implicated in the 1MDB affair. Najib has denied any wrongdoing, and on Weddnesday pleaded not guilty to the charges. Why was Najib not charged in the 1MDB probe? The simple answer is that the 1MDB investigation covers multiple jurisdictions. At the last count, money involved in the 1MDB affair is believed to have passed through the following financial systems: the United States, United Kingdom, Singapore, Switzerland, Australia, Luxembourg, Hong Kong, Thailand, United Arab Emirates, among others. It is simply not possible to put such a complex case together in such a short amount of time following the election of opposition leader Mahathir Mohamad two months ago. The good news is that, under the new Mahathir administration, foreign governments will now have access to Malaysian documents related to the 1MDB probe. The US, Singapore and Switzerland are among the countries investigating the scandal. When Najib was in power, all financial institutions in Malaysia refused to cooperate with these foreign probes. Why is SRC International different? The key factor here is a star witness, a former director of SRC International who decided to come forward to testify for the prosecution. This individual was too afraid to come forward when Najib was prime minister. That is no longer the case. There are several key witnesses in the 1MDB scandal who may be thinking along the same lines as the former SRC director. With Najib no longer in control, some of these witnesses may now turn against him, as well. Top of the list is Jho Low, the accused mastermind of the 1MDB scam. He is believed to be dividing his time between Macau and Taiwan, both places where extradition to Malaysia is not possible. Another important witness under tremendous pressure to come forward is Tim Leissner, the former Southeast Asia chairman for Goldman Sachs, the bank that handled most of the 1MDB bond sales. He was pushed to resign from Goldman Sachs in February 2016, and both Singapore and US securities regulators have banned him from working again in the financial industry. An interesting side note is that he is better known in the US as the husband of Kimora Lee Simmons, an American model and fashion designer and the former wife of hip hop mogul Russell Simmons. What’s next in the Najib case? By charging Najib, the Mahathir administration is keeping an electoral promise to take action against the former leader. But more importantly, the new government is also sending a strong message to Malaysians and the international community that it is serious about cleaning up the mess left by Najib’s government, especially when it comes to corruption. For Najib, this will likely be the first of many trials he will face, as more charges are expected in the 1MDB case. It’s also likely that Najib’s family members, including his wife, stepson and son-in-law will face charges, as they are alleged to be direct beneficiaries of the stolen funds. And this will likely bring an end to the Razak political dynasty in Malaysia for the time being. Najib’s father was Malaysia’s second prime minister and many of his immediate relations used to hold political office. Until the election in May, Najib’s cousin, Hishammuddin Hussein, had been Malaysia’s defence minister. UMNO will also need to shed its associations with Najib in order to rehabilitate its image among the Malaysian people. Last weekend, the party elected a new president, former Deputy Prime Minister Ahmad Zahid Hamidi. All in all, Najib’s arrest represents a clean break from the past for all of Malaysia. The end of one-party rule has opened up the possibility of a new era of good governance in the country, which was unthinkable just three months ago. In today’s “new” Malaysia, anything is possible – even calling to account a former prime minister who was just defeated. More importantly, going forward, the Malaysian public will demand full accountability from their leaders, both past and present. All nine of Lee Rhiannon’s federal colleagues co-signed a letter of complaint that was sent to the Greens’ national council. 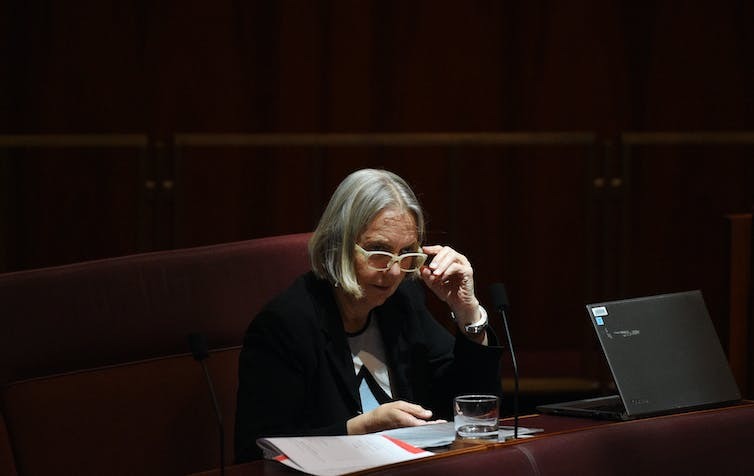 Former Greens leader Bob Brown accused Lee Rhiannon of “perfidious behaviour”, as the defiant Greens senator fought back against united condemnation from her parliamentary colleagues. The other nine parliamentary Greens, including eight senators and lower house member Adam Bandt, have written to the party’s national council complaining about Rhiannon who, when the Greens were negotiating with the government on the schools bill, authorised a leaflet urging people to lobby senators to block the legislation. Brown, a long-time critic of Rhiannon, repeated his previous description of her as “the Greens’ version of Tony Abbott”, and his call for the NSW Greens to replace her at the election with someone more popular and constructive. He said that while he did not disagree with the Greens ultimately voting against the legislation – because Education Minister Simon Birmingham had done a special deal with the Catholics – the Greens in their negotiations had obtained $A5 billion in extra money. Education was not Rhiannon’s portfolio – and for her to advocate against the Greens leader Richard Di Natale and its education spokesperson, Sarah Hanson-Young, was “untenable”, Brown said. The Greens letter said: “We were astounded that senator Rhiannon was engaged with [the leaflet] production and distribution without informing party room at a time when we were under enormous pressure from all sides as we considered our position on the bill”. It said the leaflet had the potential to damage the negotiations that Di Natale and Hanson-Young were having with the government about billions in extra funding for underfunded public schools. The Greens’ parliamentary partyroom will consider Rhiannon’s action. Despite prolonged negotiations with the Greens, the government finally concluded a deal with ten of the other crossbench senators to pass the bill. But the Greens had done much of the heavy lifting to obtain a series of amendments. This included the additional money, which takes the planned total extra federal government spending on Australian schools to $23.5 billion over a decade. In a statement on Sunday Rhiannon said she rejected allegations she had derailed negotiations and breached “faith of the party and partyroom”. She said that at all times her actions on education had been faithful to the party’s policy and process, and her work had not impacted on the negotiations. She defended the leaflets she authorised, saying they were “a good initiative of Greens local groups. “They highlighted the negative impact the Turnbull funding plan would have on their local public schools. “Producing such materials are a regular feature of Greens campaigns. These leaflets urged people to lobby all senators to oppose the bill. “I was proud to stand with branches of the Australian Education Union, particularly as the Turnbull school funding plan favoured private schools,” she said. Ever wondered what life is like for a former Prime Minister? The link below is to an article reporting on life after politics for former Prime Minister Julia Gillard. The link below is to an article reporting on the guilty finding in the trial of Guatemala’s former leader of genocide. The link below is to an article reporting on the death of Margaret Thatcher, the former Prime Minister of the United Kingdom. There are conflicting reports coming out of Egypt concerning former Egyptian president Hosni Mubarak. Recent reports indicate that he is clinically dead, others that he is unconscious following a stroke. Egypt’s ousted ex-president Hosni Mubarak is “clinically dead”, according to reports. The following article reports on reforms taking place within the former Children of God sect, now known as The Family International (TFI). The following article reports on Hassan Sharif Lubenga, a former member of the terrorist group Boko Haram and the opposition he now faces as a Christian. The articles linked to above are by Compass Direct News and relate to persecution of Christians around the world. Please keep in mind that the definition of ‘Christian’ used by Compass Direct News is inclusive of some that would not be included in a definition of Christian that I would use or would be used by other Reformed Christians. The articles do however present an indication of persecution being faced by Christians around the world.